Hello, my name is Sabrina Grayson and I’m a Necromancer. Aren’t you all supposed to then say, “Hi, Sabrina,” in that monotone way that all groups reply? Sorry, I’m still a bit brain fried from my argument with Lucifer, my fight with the demons and witches, the events of Christmas Eve, and the fact that Alex has me at the dojo every day in prep for Sal and his boss to return to the city, which could be any day. BUT, I don’t want to say more, lest I ruin the story I wrote for you all that comes out on September first, called Mark of the Necromancer. Sure sure…some chick named Tamsin L. Silver has her damn name all over the cover and whatnot, but it’s my story and don’t you let her tell you otherwise! You’ll notice she sort of understands…I mean, it does say, “A Sabrina Grayson Novel” on the cover. But still. Just because I imparted my tale to her and she typed it up, she feels she gets to say she wrote it! The gall! OK…where was I? Oh yes, my name is Sabrina and I’m a Necromancer. What does that mean? Well…it means I see dead people. Yep. There you have it. But this isn’t some fictional tale by M. Night Shyamalan. This is my life. First off, I’m prettier than him with a much better sense of fashion, thank you very much. Secondly, I can see and talk to spirits whether I am traveling on the Earthly plane OR the Death Highway. Hmm? The Death Highway? Oh, that’s how spirits that have not crossed over yet (to Heaven, Hell, or Rebirth) travel around the globe. It’s rather trippy, I won’t lie. Sadly, the only spirits that I see on either plane are seeking my help with unfinished business due their untimely demise and no idea of why or who caused it. They need closure so as to move on, so I help them figure out who killed them, why, and attempt to bring the murder(s) to justice. If the spirits who came to me knew that information, solving their murders would be wicked easy…but getting to the bottom of who was behind the killing of me and my friends was not. If it had been, the book coming out in just a few days would’ve been a short story or novella. But alas, it’s a full novel filled with a twisting story about love, betrayal, dead people, hot detectives, crabby spirits, my ghost bestie, the cute boy next door, and family drama. Oh, and Satan…let’s not forget his handsome, well-dressed self, shall we? Sure, there are also Mediums, Goblins, Fae, Vampires, Witches, Werewolves , and so on…for they are who make up the supernatural world here in New York City, but they aren’t the reason I’m here today. Like all of you who come here to admit your issues (and get free coffee, tea, and cookies), I suppose I’m here to discuss mine as well. I know they say that you cannot move forward and heal until you admit your addiction, guilt, or whatever it is you need to throw out into the world. That way you can move forward with your life…or in my case, my unlife. Okay, let’s get this out there…I need to confess, or what’s the point of coming here today, right? I, Sabrina Grayson, am a shoeoholic. The book is available in print via Amazon or by visiting Tamsin at Dragon*Con this year. As always, she and all her books (Windfire Series will be available too) will be a part of Tairen’s Lair & Author’s Lair, now located in America’s Mart (Building 2) at Booths 1223 & 1225. If you prefer E-books, you can get a copy of Mark of the Necromancer for your Kindle on Amazon or Smashwords (who have all e-formats, from mobi/Kindle, e-pub/Nook, Sony, and PDF). Plus, it will soon be live with Apple through iBooks and on Barnes and Noble. Sabrina Grayson is dead and it's the best thing that has ever happened to her. As a child, Sabrina saw ghosts, but with age and parental influence, she forgot all about them. That is, until fate stepped in to bring her back where she belonged: with the dead. Now she's a Necromancer; the only one who can travel the Death Highway and walk the Earth. As a new member of the supernatural world, Sabrina discovers the truth about her past and must learn who she really is. To do this, she will have to team up with Detective Alex Price, the one man she can't stand. Only together can they figure out who murdered her and why they are killing her friends off one by one. 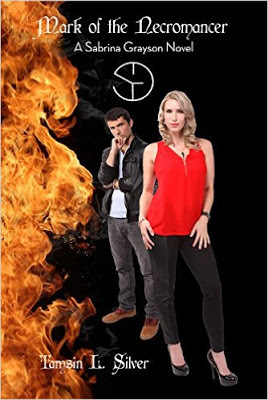 Determined to save them and the city she loves from the evil plot they uncover, Sabrina will put her soul on the line...even if it means going to Hell and fighting Lucifer himself. 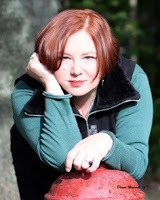 I am a Young Adult Urban Fantasy Author. The first four books of my "WINDFIRE" series are out and you can purchase an e-copy or a print version of them on Amazon and on Smashwords. I am the creator/writer/director for the online TV Show, "Skye Of The Damned," which you can see more on at: www.SkyeOfTheDamned.com Currently I live in NYC where I not only work just at my craft as an author but in the theatre/film world as well, where I write, direct and design. I hold a degree in Theatre/Secondary Education from Winthrop University and have had my writings performed on stage in NYC and now on web TV. I, Nancy Jones, am a chocoholic. I, BookLady, am a bookoholic and a chocoholic.